All original documents requiring Attestation or Apostille by the Ministry of External Affairs, New Delhi, are required to be first authenticated/attested by the designated authorities/departments of the State Governments/Union Territory from where the documents were issued. MEA Attestation can only be done after the respective relevant state authority has attested a particular document. 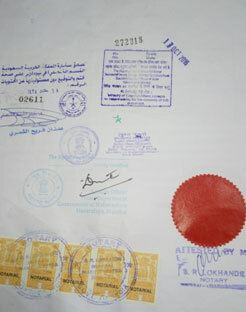 The documents (like birth or death certificates, marriage certificates, affidavits, driving licenses, etc.) are required to be first attested by the State Home Department of the issuing State/Union Territory. The authentication must be done with the name and designation seal as well as the seal of the Department. The documents should be first attested by the State Education Department of the concerned State Government/Union Territory. The authentication must be done with the name and designation seal as well as the seal of the Department. The documents are to be pre-authenticated by the respective Chambers of Commerce before these can be attested by the Ministry of External Affairs, New Delhi. The rubber stamp of the respective Chamber of Commerce must be affixed on each document along with the name & designation of authorized signatory. The Ministry of External Affairs (MEA) attests /legalizes the documents only after these have been authenticated with the signature and seal/stamp of the designated authorities of the State Government/Union Territory/Chambers of Commerce from where the documents have been issued. The MEA legalizes the certificate/documents on the basis of the signature of the designated authorities; hence it does not take responsibility of the contents of the documents. It is relevant to mention that the MEA does not legalize or attest photocopies of the documents. Applicants are advised not to rely on unauthorized persons for MEA Attestation services. Documents can be deposited in our “Collection & Delivery” Office between 0900 hrs and 1800 hrs from Monday to Saturday. Documents can be deposited and collected back either in person or through an authorized representative. Documents will be returned only on production of receipt for payment of service charge. However, in case the document is found fake or the authentication forged, the same will be seized by the Ministry of External Affairs. The Ministry may also initiate appropriate legal action against the applicant. The service charge paid to us cannot be refunded in any circumstances. The Countries which are not signatory to the Hague Convention 1961 require and accept Indian documents Attested by the Ministry of External Affairs, New Delhi, as valid documents for further processing by their respective Embassies/Consulates for various purposes. Thereafter these attested documents can be used in the foreign country concerned.